Next Article Radnička partija (Turska) kaže ne sudskom aparthejdu: hitno oslobađanje svih dugogodišnjih pritvorenika u slučaju Ergenekon! It sometimes seems as if Europe’s sovereign debt crisis has been going on forever. But in fact it really only manifested itself in 2010, a result of the bailing out of private banks with public money and other public spending due to the crisis. And in May of that year Greece became the first country to ask for help and to receive so-called “aid” – really, it cannot be repeated too often, loans that must be paid back – from the now infamous "Troika", the IMF-ECB-European Commission. This aid was conditional on Greece adopting policies of austerity and structural reforms, all regularly supervised by those who have become known as the “men in black”, the inspectors of the Troika. In an article in the UK Guardian on October 8, 2012, Alexis Tsipras, leader of the radical left coalition Syriza, makes two key points. First of all, the money lent to Greece goes into an escrow account used for repaying past loans and interest on them and for recapitalising private banks. It cannot be used otherwise, for example for useful social spending. Second, he writes: “We believe that their aim is not to solve the debt crisis but to create a new regulatory framework throughout Europe that is based on cheap labour, deregulation of the labour market, low public spending and tax exemptions for capital." That about sums it up. Greece became the guinea pig for these policies. It would soon be followed by Ireland and Portugal, who also applied for bailouts within a year. But Tsipras was right to say “throughout Europe”. The Financial Times on October 2, 2012, revealed the existence of a draft agenda already circulated to EU governments that “would require all 17 eurozone members to sign on to the kinds of Brussels-approved policy programmes and timelines now negotiated only with bailout countries”. Those may be the plans that Brussels, Berlin and Frankfurt have for the whole of Europe, and we can see everywhere that that is the direction in which things are going. But for the moment they are only being applied in such a brutal fashion in Greece, Portugal and Ireland, and also in Spain and to a lesser extent Italy, two countries that may in their turn have to apply for aid from the Troika. It is therefore important to look not just at the effects on those countries but especially at how their peoples have been able to resist. From this point of view the countries that we will look at are Greece, Spain and Portugal. It would take much too long to describe in detail the hundreds of strikes, demonstrations and occupations that have taken place in those countries and indeed in others. But in the course of this year, and even particularly this [northern] autumn, resistance seems to have taken on a new scale and a new dynamic is some countries. We are seeing the development of an ongoing, permanent mass movement, in Greece and Spain certainly, and perhaps also in Portugal. Greece is unquestionably the country that has suffered most from the policies of the Troika, aided and abetted, it must be said, by successive Greek governments. It is easy to cite the basic figures: 24 per cent unemployment, 55 per cent youth unemployment, wages and pensions reduced by around a third, deep cuts in education and health. It is also necessary to be aware of the daily human consequences, children going hungry, lack of medicines, homelessness, a dramatic rise in the number of suicides. These policies are accompanied by a massive propaganda offensive, seeking both to convince the population that it is responsible for the budget deficits and has to make sacrifices and to instill fear of the international consequences of any policies that would break from the dominant neoliberal mould. Clearly, for large parts of the population this discourse no longer works, people no longer believe it. And as popular opposition increases the government imposes its policies in an increasingly authoritarian and repressive fashion. And alongside the growth in support for the radical left, there is the emergence of Golden Dawn, a genuinely neo-Nazi formation that is now, according to polls, supported by 12 per cent of Greeks. In the three countries we are considering, where does the opposition come from, how is it structured? In fact in each country we have seen three sources of resistance, not in the same proportions: the trade unions, the parties of the radical left (to the left of social democracy) and autonomous movements of young people. Opposition in Greece began as soon as the country applied for a bailout, with a general strike called by the two main trade union confederations GSEE (private sector workers) and ADEDY (public sector workers) on May 5, 2010. Since then there have been more than a dozen one-day general strikes and innumerable sectoral strikes. It is of course easy to criticise the trade union leaderships which do not go beyond such strikes and who for a long time remained tied to PASOK. Nevertheless these strikes objectively constitute one element of popular resistance. The second is constituted by mobilisations of youth, whose origins go back to at least 2008 and the killing by police of a young school student. Particularly under the impact of events in Spain (see below) this took on a particularly organised form in the summer and autumn of 2011, with occupations of public squares. But it never took on the dynamic or the scale of the movement in Spain. One reason was certainly the role played by the radical anticapitalist left. In the 2009 general election the Greek Communist Party (KKE) and the Coalition of the Radical Left (Syriza) won respectively 7.54 and 4.6 per cent of the vote, compared to nearly 44 per cent for the victorious social democrats of PASOK. Hardly enough to make the capitalists quake in their boots. A few months later Syriza (or more exactly, its main component, Synaspismos) suffered a split to the right, leading to the formation of the Democratic Left. However as the crisis progressed and austerity made itself felt, from the autumn of 2011 opinion polls began to show a level of support for the three parties of the radical left of around 30 and sometimes nearly 40 per cent. Given the deep divisions between the three forces, these results repeated in a general election could just have provided one more example of the inability of the left to unite. But these divisions were not some kind of genetic defect of the left. They had political roots in the mind-boggling sectarianism of the KKE and the orientation of DL to be a left pressure group on PASOK. And Syriza dealt with the question politically, developing an orientation that was both radical and unitary. Proposing a government of left forces committed to breaking with austerity and repudiating the agreements (memorandums) concluded with the Troika. Syriza thus emerged as far and away the dominant force to the left of PASOK, and the KKE and DL paid the price for their political positions. In the May elections Syriza became the second political force in the country, with over 16 per cent. Now the capitalists were really quaking in their boots. The full battery of European institutions and governments was deployed to campaign against the danger of a Syriza victory in June, a danger narrowly avoided as Syriza, with nearly 27 per cent support, came a close second to the right-wing New Democracy party. It is worth looking at the extent of Syriza’s support as revealed in that election. It was the biggest party among all those aged 18-54 (45.5 per cent in the 18-24 age group) and among workers of both public and private sectors, the unemployed, students and the self-employed. Not surprisingly Syriza was the first party in all the working-class areas, especially in greater Athens, which has almost half the country’s population. It is also important to note that as PASOK’s support melted away (12.28 per cent in June) and the party began to implode, many activists joined Syriza, including MPs and trade unionists. Similarly, the KKE, which had taken 8.48 per cent in May and refused even to talk to Syriza, dropped to 4.5 per cent. Syriza, which was established in 2004 as a coalition, is now engaged in a process that should lead to it becoming a party next year. The existence of a left force as representative as Syriza, a political alternative to the fragile coalition government, is the fundamental fact of Greek politics, and what makes the situation there different from any other country in Europe. Of course, if people were just sitting back and waiting to vote for Syriza in the next election, that would be a problem. But that is hardly case. The growth of Syriza is taking place in a context of ongoing mobilisation. September 26, 2012, saw the latest (and the first since the elections) one-day general strike, with a demonstration of 100,000 in Athens and 15,000 in Salonika. The big battalions came from the public sector but there was a significant presence of the private sector workers, where to go on strike is much more likely to lead to being sacked. Even the employers’ organisation recognised that 20 to 30 per cent of private sector workers joined the strike. And on October 8, in the face of an unprecedented police operation blocking off a large zone of Central Athens, thousands demonstrated against the visit of Germany's Chancellor Angela Merkel. Given the depth of the recession and the scale of the attacks, it is not inconceivable that the coalition government could fall – for example that its two weakest components, PASOK and DL, could be unable to keep their parties on board. Already cracks are emerging. On October 14 the Left Initiative current in PASOK demanded that the party quit the government. This is in a context of negotiations with the Troika, which is now posing more demands, including increasing the working week from five to six days. The possibility of a left government led by Syriza is a real possibility. That would be an enormous step forward, but it would also be fraught with danger and difficulties. A left government would be subject to all sorts of economic and political sabotage and pressure, internally and externally. And Syriza is very conscious of the fact that at the present time there is no other country where the radical left is in the same position as it. In Spain and Portugal, one of the main ways in which resistance has been expressed is through the appearance of new social-political movements organised by the young people who are among the main victims of austerity. This is an important development, which began in both countries in 2011. It is important because young people are organising themselves without waiting for parties or unions. But it should not be looked at in isolation or elevated into a panacea. In fact if we look at the recent mobilisations in Spain and Portugal we will see that unions and parties are involved, as well as the new movements. Although Spain is not yet in the situation of receiving a bailout, the general opinion is that it will soon. We could sum it up by saying that the economics (banks, sovereign debt) add up to such an eventuality, but Spanish politics militate against it, the Rajoy government being manifestly reluctant to be saved, that is to have conditions imposed and supervised by the Troika. In this respect Spain is actually no different from the three bail-out countries, all of whom resisted being saved for as long as possible. The reason is simple: when the men in black arrive to dictate austerity measures and structural reforms, it is electoral and social poison and it has already led to governments falling in Ireland, Greece and Portugal. It is not that the governments in question actually object to austerity and reforms, they simply want to do them in their own way in terms of their own national situation. Greece is already in a situation of limited independence, of being an EU protectorate. Portugal is moving towards the same situation. On the other hand international politics, the pressure of the EU the ECB and of course the markets are pushing Spain towards a bail-out, whose first and principal aim is to guarantee the repayment of loans and interest on them. If this happens to Spain it will exacerbate an already tense social and political crisis. Spain has already gone a long way in applying austerity policies and reforms. They began under the Socialist Party government of Zapatero in 2010 and have been continued and accentuated since the victory of Rajoy and the right-wing Popular Party in the November 2011 election. The first striking result was the appearance in May 2011 of the indignados or M15 movement, a movement of young people clearly related to Greek-style levels of unemployment (over 50 per cent for young people) and no prospects. On May 15, 2011, operating via social networks, hundreds of thousands of young people occupied squares in towns and cities all over Spain, including Madrid and Barcelona. These occupations lasted for weeks while the indignados worked out their ideas. Finally, they evacuated the squares and fanned out to engage in local campaigns. The movement was not linked to any political party. It would however be completely inaccurate to describe it as apolitical. It criticised not only the social and economic policies of the government but the limitations of the two-party system in Spain, demanding “real democracy” and produced positive proposals. These were expressed notably in a remarkable 16-point document adopted by the Madrid assembly in Puerta Del Sol on June 5, 2012. The indignados never went away. They mobilised for the international day of action on October 15, 2011, and again in May 2012 on the first anniversary of the movement. But the focus shifted as the trade unions began to move. It has to be said that the role of the union leaderships in the first period of the crisis, under the Zapatero government, was less than glorious. But after the election victory of the right they began to move, with mass demonstrations in February and a general strike on March 29. As the unions came to the fore, M15 was part of the mobilisations, albeit with a definite distrust of the union leaders. On July 19, 2012, the two main union confederations, the CC.OO and UGT, called another strike, involving smaller unions and social movements in its organisation. A massive 3.5 million people demonstrated across the country. The July 19 strike had been preceded by the March for Dignity of the Asturian coal miners fighting to defend their mines and jobs, from the Asturias to Madrid. 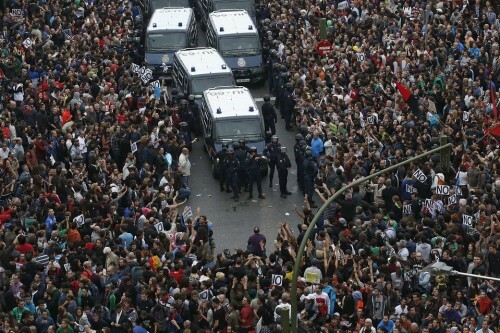 This autumn saw a new wave of mobilisation, starting with a demonstration in Madrid of 500,000 people on September 15. Then an initiative came from the M15 movement, or rather from what appear to be radical spin-offs from it, Coordinadora 25S and Plataforma En Pie! (“Stand Up!”). On three successive evenings, on September 25-26-27, up to 50,000 demonstrators tried to encircle the parliament, calling for the resignation of the government and declaring “democracy kidnapped”. There were violent clashes with police. A mass demonstration took place the following Saturday, September 29. On September 26, there was a general strike called by the Basque trade unions (linked to the Basque national movement, not part of the Spanish confederations). Unlike on March 29, the strike was not backed by the CC.OO and the UGT, so it was unevenly supported, depending on the sectors and workplaces. However the demonstrations were massive, with a high participation of young people. Further demonstrations took place all over Spain on October 7. Another one-day general strike is envisaged for November 14, the same day chosen by Portugal's unions. In Portugal, the first signs of autonomous movement among young people were seen even earlier than in Spain. On March 12, 2011, demonstrations against precarious work organised on Facebook brought 300,000 people into the streets, 200,000 of them in Lisbon. A week before, the organisers had hoped for a demonstration of 10,000. But subsequently there was a downturn in mobilisation. In April 2011, Portugal applied for a bailout and a few weeks later elections brought a right-wing government to power committed to carrying out the terms of an agreement with the Troika. The Socialist Party (SP), now in opposition, also backed the agreement. The two forces to the left of the SP, the Portuguese Communist Party (PCP) and the Left Bloc fared badly in the election. The PCP held its vote stable, but the Left Bloc lost half its votes and half its seats. Since then there have certainly been protests – two one-day general strikes, big demonstrations. But not on the scale of Greece or even Spain. Overall, up until recently a large section of the Portuguese people accepted austerity with a certain resignation, helped by an ongoing campaign in the media about how necessary austerity is and how things would soon get better. That all changed dramatically on September 15, 2012. A national demonstration was called by a collective of 29 people. Word went out via social media in the same way as for the demonstrations in March 2011 and the M15 in Spain. The result was 1 million demonstrators across a series of Portuguese cities on September 15, including 500,000 in Lisbon – the biggest demonstration there since May 1, 1974, a few days after the fall of the Salazar dictatorship. The reason for the breakthrough was a measure that had been announced in the government’s latest austerity package on September 7. It provided a particularly clear expression of who the government was helping and who it was hurting. The measure envisaged deducting an extra 7 per cent in social security contributions from workers’ salaries and simultaneously reducing employers’ contributions by 5.75 per cent. This was described by one observer as the straw that broke the camel’s back. The government was forced to withdraw the measure but has announced new tax increases to replace it. But the genie is out of the bottle and since then there have been fresh protests. In terms of the social situation, Spain is only comparable to Greece, which explains the scale of the ongoing mobilisations. But the crisis is also laying bare the country’s political fault lines. In particular it is underlining the limits of what is called the “Transition”, the period from the death of General Franco in 1975 until the adoption of a new constitution in 1978. In at least three spheres: the national question (limited autonomy, no right to national self-determination), the amnesty law (no prosecution for crimes committed by the Franco dictatorship) and the question of democracy (no republic, but a “parliamentary monarchy”). Spain came out of the Transition with a considerable degree of decentralisation, powers devolved to the regions. But the term “regions” covers the historic Basque, Catalan and Galician nations, regions with a strong identity like Andalusia, and ordinary Spanish provinces that were not even demanding the devolution they got. In fact the whole operation was an attempt to make granting statutes of (limited) autonomy to Catalonia and the Basque Country acceptable to the Spanish right by wrapping it up in a general process of decentralisation. The reality was however that both nations got rights in excess of those given to the Spanish regions. The Basques, but not the Catalans, got a statute of autonomy with the right to control their own tax revenues. Under cover of the role of the regions in the overall deficit the Rajoy government is trying to recentralise, to repatriate powers to Madrid. But this is not just an economic issue. There is an offensive against Catalan identity and language, with provocative declarations from Spanish politicians, for example the minister of education talking about the need to “Hispanicise” Catalonia. The Catalan response was a massive pro-independence march of 1.5 million people in Barcelona on September 11, Catalan National Day. Faced with no concessions from Madrid, the Catalan government has called a snap election for November 25, which may give it a mandate for a referendum on independence. The present Catalan government is certainly not on the left and applies its own austerity policies. It is also reluctant in its support of independence. But it is being pushed forward by the mass movement. And other, left independentist currents are developing and will stand in the elections. The national question is likely to become even sharper after regional elections on October 21 where the left independentists of EH Bildu (see http://links.org.au/node/3068 for results and analysis) are seeking to repeat their success in last year’s local elections in the Basque Country. Even in the more conservative Galicia, an alliance between the local Izquierda Unida (IU, United Left) and a new movement, ANOVA, which has been described as the “Galician Syriza”, may make a modest breakthrough. Spain is heading for a political and constitutional crisis and all the chickens of the half-baked Transition are coming home to roost. Not only is the government of the Popular Party, which was of course founded by former Francoists, revealing its deep-seated Spanish chauvinism, but officers of the Spanish armed forces, who under the Amnesty Law of 1977 were never pursued for crimes against humanity committed under the Franco regime, are making threatening declarations. Leading right-wing politicians are demanding that the statute of autonomy be suspended and the Civil Guard sent into Catalonia and the association of retired officers are threatening Catalan politicians with being tried by military tribunals for high treason. In Portugal, the situation is quite different in that respect, due to the way the dictatorship was overthrown by a revolution in 1974, the role the army played in it and the heritage of a revolution that, although it was prevented from becoming the socialist revolution many of its participants wanted, has left serious traces in Portuguese society. Thus, on September 14, 2012, the Officers Association of the Portuguese Armed Forces (AOFA) adopted a declaration that affirmed that “‘the military can never be an instrument of repression for their fellow citizens, because according to the Constitution we swore to defend them”. It went on to make very sharp criticisms of government policies, difficult to imagine on the part of serving officers in most other countries. The level of mobilisation in Spain is fast approaching Greek levels, and hopefully resistance in Portugal will now grow stronger. The situation of the radical left is obviously less advanced than in Greece, but far from marginal. In Portugal an opinion poll in September showed the PCP on 13 per cent and the Left Bloc on 11 per cent, a big improvement on 2011. Considering that relations between the two parties seem to be improving, that could be the beginning of a serious alternative. Furthermore relations, between the new social movement and the parties seem not so bad; several of the 29 people who made the call for the September 15 demonstration are Left Bloc members. On this level, things are more problematic in Spain. The United Left doubled its vote in 2011 compared to the previous election and has now pretty much doubled again in opinion polls, at 12-13 per cent. It has sought to open out and had some success in collaborating with the M15; some figures from the movement stood on the IU lists in the 2011 elections, at least one being elected. However, the evolution of some sectors of the M15 towards what may be the beginning of political organisations may mean that developments on the left will be more complicated in Spain. This article has dealt with three countries, which are the most advanced at this point. But of course that does not cover the whole scenario. Movements of resistance are weaker in Ireland and Italy, for reasons that can be understood in each case, but they exist and the situation could change quickly, particularly in Italy. Nor have we dealt with the situation in central and eastern Europe, where not only are austerity policies being applied in many countries, but there have been important movements of resistance, notably in Romania and the Czech Republic. One country however that deserves to be mentioned is France, where we may be seeing the lull before the storm. President Francois Hollande and his Socialist Party government are coming under increasing pressure to renege on their election promises and fall into line by applying austerity policies and labour and pension reforms. The odds are that they will gradually give in to these pressures. In this situation it is not unimportant that there is a strong opposition on the left. The Left Front (Front de Gauche), which had won 4 million votes in the presidential election, launched in September a campaign against France signing the Treaty on Stability, Coordination and Governance, usually called the "Fiscal Pact", designed to set austerity in stone. This was a point on which Hollande had very clearly capitulated, in spite of his election promise not to sign the pact unless it was renegotiated. On September 30, 80,000 people demonstrated in Paris against France signing – a front involving not just the Left Front but other political forces, including the New Anticapitalist Party and dozens of trade unions and associations. The Greens party, which is part of the government, decided to vote against and most of its MPs did so, as of course did the Left Front MPs. Very significantly, so did 20 Socialist Party MPs, nine more abstaining, in spite of huge pressure from the party leadership. The significance of the fact that the first national movement of opposition to a decision of the Socialist Party government came from the left was not lost on the political world or the bourgeois media. It augurs well for the future.